Flying with Hot Air Ballons Somewhere, over the rainbow...Flying with Oz. Nowadays, the hot air balloon comes in many shapes and forms, from rocket ships to sausages and teddy bears. The passengers and loads are usually carried in a gondola which has a source of heat, in most cases- an open flame. The heated air then travels inside the balloon which makes it lift and buoyant due to its density being lower than the air outside the balloon. Unlike gas balloons, the envelope of the hot air balloon doesn’t have to be hermetically sealed due to the gas not being kept under pressure, but instead it having the same pressure as the surrounding air. Today, most of hot air balloons are made of nylon, and the base of the balloon (the inferior part which is closer to the heating source) is made out of a heat-resistant material, such as Nomex. Hot air rises. The envelope traps a large bubble of hot air. If the air in the envelope is heated by a burner, the balloon will rise. If the air in the envelope is allowed to cool, or if the hot air is vented from the top or side of the envelope, the balloon will descend. An altimeter is used to measure altitude and rate-of-climb. The altimeter and an envelope temperature gauge are the only instruments used in the balloon. How high do balloons go? Flights in hot air balloons have been recorded at more that 15000 meter. The flying altitude always is depend from the pilot. 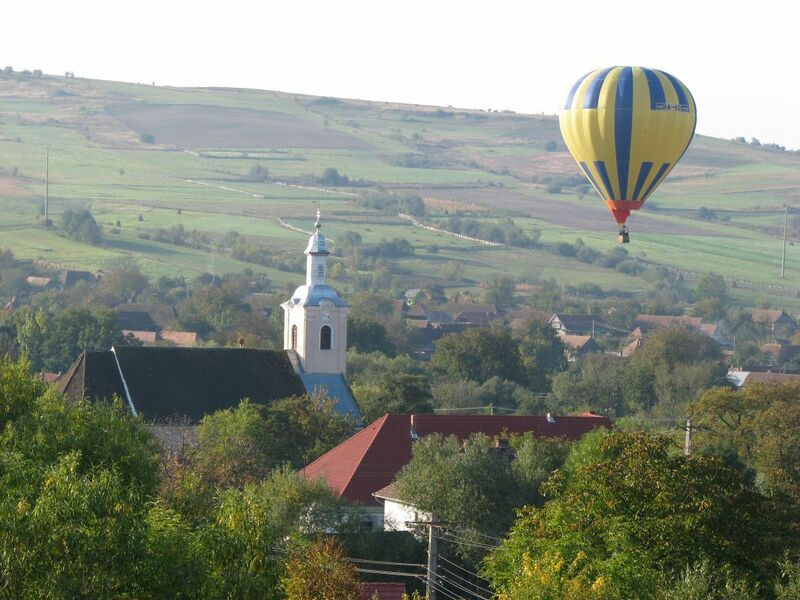 However, the sport of ballooning is most enjoyable when flying at 60 to 150 meter, just above the tree tops. When balloons fly over populated areas, they maintain an altitude of at least 300 meter. How do pilots steer the balloons? They really don’t. A balloon drifts in the same direction and at the same speed as the wind. The skill is for the pilot to pick the altitude that has the most desired wind direction. Surface winds and currents sometimes blow in a very different direction from the winds aloft. Altitude control is achieved with the burner. Longer burns achieve lift; shorter burns or none at all allow the air inside the envelope to cool as the balloon descends. Since a balloon travels with the wind, it is not possible to determine an exact landing site prior to launch. However, a pilot is able to determine the general direction of the flight through the study of wind currents. Nowadays, the hot air balloon comes in many shapes and forms, from rocket ships to sausages and teddy bears. The passengers and loads are usually carried in a gondola which has a source of heat, in most cases- an open flame. The heated air then travels inside the balloon which makes it lift and buoyant due to its density being lower than the air outside the balloon. Unlike gas balloons, the envelope of the hot air balloon doesn’t have to be hermetically sealed due to the gas not being kept under pressure, but instead it having the same pressure as the surrounding air. Today, most of hot air balloons are made of nylon, and the base of the balloon (the inferior part which is closer to the heating source) is made out of a heat-resistant material, such as Nomex.